Expect to start 15 minutes late, but do your best to start on time. If you are hanging signage, check with the facility to find out what material will work best. Use extra tape if you are using masking tape. Bring multiples up at once. This saves time. Example - instead of calling out award winners one at a time and having all that extra "walking to the stage time", bring up all the potential winners at once and then call out the winners. 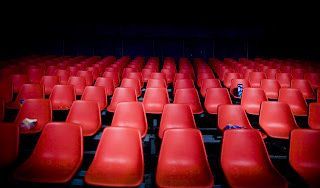 If you are doing a PowerPoint or Video, show up at least 60 minutes before you expect the first people to show (which could be 45 minutes before start time) and get it set up. Have a backup copy of any PowerPoints on a thumb drive and have a backup laptop handy. Also, google "great PowerPoint design" or type PowerPoint in the search box of this blog. Basic rule, PowerPoint should be visually-based, not textually-based. Have something showing on the screen while people are coming in. Picture show, random quotes show, inspirational images, etc. Give fewer, but more valuable door prizes. If you are giving out a good number, don't give out more than five at once. Also, spread them out throughout the program. Triple check the mics and music the morning of. Make sure there are brand new batteries in all equipment. Have upbeat music playing before people show up until you start. The music should fill the room. Make sure the playlist is entirely CPP (Clean, Powerful and Postive). Have gophers - people who follow the people in charge and do misc. tasks. Have greeters to give directions. Have multiple sign-in lines to avoid bottlenecks. Have seating assistants moving people to the front rows and center sections. This helps remove the energy gaps in the room and helps build attention and excitement. Be ok with letting out early, but never go over time. If you have specific questions about your conference set-up, email me (rhett @ yournextspeaker.com). I have attended literally thousands of conferences throughout my career. I can and want to help. 1. Stage art falling off the wall. 2. Girl in front row laughing uncontrollably for 3 minutes. 3. A mystery explosion in the fourth row that I think was a balloon popping. 4. Microphone signal dropping out every 12 minutes. 5. What sounded like a herd of water buffaloes stampeding in the room next door. Was actually a facility worker pushing a cart full of something. Biggest reason for going interactive on keynotes is to effectively manage attention spans and to help the audience "do the message" not just hear the message. Great way to manage the interactions to maximize attention and retention is to build in transitions - funny to solemn, moving to still, music to voice, listening to talking, loud voice to quiet voice, etc. 1. Expect them beforehand. Have a mind like water. Don't get caught off gaurd by having a rigid mind that absolutely has to stay on plan. This will get you in a more pliable mind-set that will be able to remain calm, relaxed and responsive (instead of reactive). 2. Trudge through them with a smile on your face and love in your heart. Unless it is someone actually being distruptive in a harmful manner, smile through the off-plan moments and enjoy them. If you are calm and enjoying the off-plan moments, your audience will be more likely too, as well. 3. Handle it appropriately relative to the distraction's size and context. If it is something small, let it go with maybe a raised eyebrow and a smile. If it something larger (like Alexia in the front row who could barely breathe while explosion-laughing for 3-minutes), stop where you were going and go ahead and let the moment live. If the distraction is large, your audience's attention is there anyway, so it is pointless for you to go on. Let your personality decide how you handle them, but the default is to have some fun with it (in a positive manner). Just restart from where you were and act like it never happened. It is amazing how quickly a group can shift attention back and forth if their leader (you) takes them there confidently, smoothly and efficiently. 5. If you have a good number of off-plan moments (like I had tonight), you are taking time away from your original plan. Don't try to cram everything in. Better to make quick adjustments mid-stream, prioritize your remaining content and let the audience really get the big messages than to have them barely remember all of them because you had to blow through. 6. Above all else, remember that everything that happens does so for a reason. Just because you didn't plan for it to happen, does not mean it wasn't supposed to happen. Be like a great surfer - live in the moment, keep your feet underneath you, be ready for anything and have an awesome time! What are the two most important qualities of speakers? 1. Being authentic once the speaker gets off the stage. A major client told me recently she is very careful with some speakers once they are off the stage around her students. Not inappropriate touching stuff - just that they are jerks to kids following their speeches Another client asked me recently "will you eat lunch with the students after the assembly". I said "love to" and he hired me on the spot. Said last years speaker said " I talk to kids, don't eat with em" Means a lot to the client when we are real with their kids. 1. I think it is getting the audience to do something/action/change otherwise it is just storytelling. 2. Being a catalyst for deeper thinking is the other. 2. Being able to communicate those points succinctly and meaningfully. 2. The ability to relate and connect with audience. 1. The ability to make connections that make people think. Whether it's connections between audience members' experiences/emotions and some point the speaker is making, or presenting thoughts/concepts in a new way, I always appreciate when a speaker makes me think. 2. Energy. Great speakers have a passion or energy that makes them engaging. Doesn't mean they have to be loud or boisterous, just means they radiate an energy that makes you want to listen. 2. Be passionate about what you are speaking about. 1. Has something to say. 2. Has an unmissable ability to say it. 1. Knowledge of the audience, subject and desired end result. 2. Innovation in the way presented. Whether it be funny, insightful, witty or emotional.